We are docked at a marina in Nassau Harbour, having pulled in just ahead of slack tide this morning. It's our first dock since leaving Turtle Cove in Providenciales in May, and only the second dock since leaving Florida in March. We're here principally because I am flying to Dallas for a Red Cross training symposium tomorrow. When Louise leaves the boat for a few days or more, I often remain at anchor, but when the tables are turned we prefer a dock. She'd rather not have to deal with the finicky tender. Louise will be holding down the fort and keeping Angel company for the five days I am gone. Honestly, the timing is right for it, too, in the sense that it is now hot, humid, and still enough that air conditioning is a welcome relief, and it will be nice to have water available to deal with the accumulated backlog of laundry. At the moment, the water is down for repair -- this is still, after all, the Bahamas. 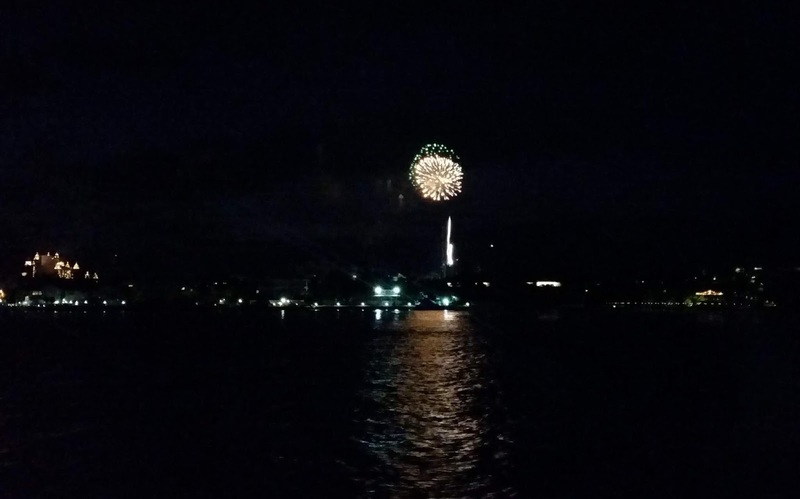 Fireworks over Paradise Island, from our anchorage. Atlantis resort at left. I don't know the occasion. We had a very pleasant cruise from Allens Cay to Nassau Harbor on Thursday. 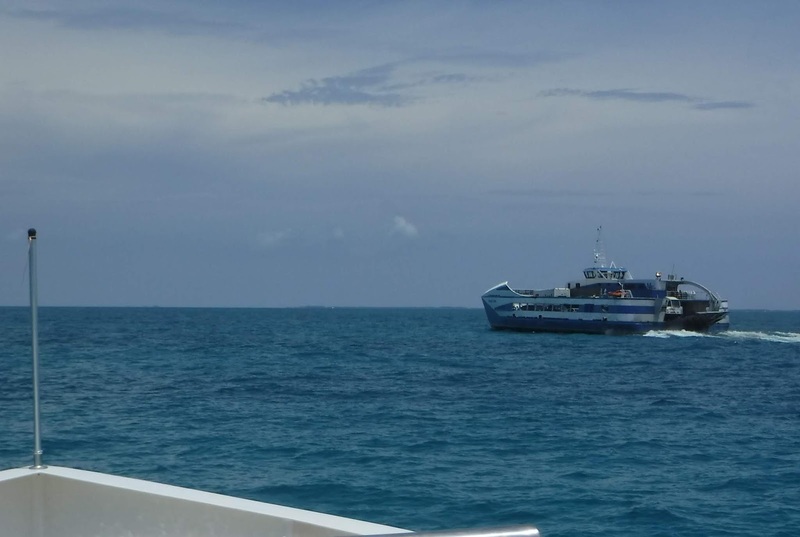 We spent a half hour on the flybridge as we crossed the middle of the Yellow Bank, where the ability to see the corals in the water is critical. 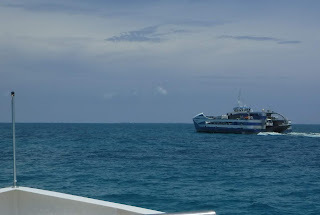 Two mailboats passed us on their way back to Nassau as well. We called Nassau Harbour Control for permission to enter as we were just outside the eastern light, right after the mailboats. I had barely hung up the microphone when we heard Loose Seal call in as well; they turned out to be just a mile behind us, coming from northern Eleuthera. We hailed them on the radio and agreed to meet up Friday, as they needed to spend Thursday dealing with Customs, and were planning to leave here this morning. Unlike Highbourne, Nassau Harbor was uncrowded, reminding us of how quiet George Town was. On our last pass through here, we had to anchor another half mile away, there were so many anchored boats. Wednesday evening there were but two on this side of the Sidney Poitier bridge. We dropped the hook just a short distance from the marina (map). Loose Seal cruised on past us to this same marina. We splashed the tender after cocktail hour and dinghied in to The Poop Deck, a casual restaurant overlooking the Yacht Haven Marina. Apart from the Green Parrot across the harbor, where we ate on our last pass, it's really the only boat-in restaurant option in the harbor. On our way we spent a little time sounding out the fairway and slips in this marina as well. Back at Vector we were treated to a fireworks show, visible over the ocean across Paradise Island. Mailboat passing us. This swoopy catamaran we think is the one we saw in Salt Pond. Yesterday morning we tendered in here to talk to the dockmaster and get our slip assignment. With the thruster acting up I wanted to have my docking game plan all laid out ahead of time. We got back to Vector in time for lunch and to have a conference call with our financial planners, who are in the process of moving to a different underlying brokerage. I'll have to sign some papers while I am in Dallas and mail them back. I spent most of the afternoon getting ready for my trip. That included finalizing all my parts orders, and spending a couple of hours on the Red Cross web site taking some on-line prerequisite training and reading documents. Some of the material has either changed or been created since the last time I was out, and that was just in October. At 5:30 we dinghied back over to the marina to meet up with Meghan, Ben, and Mason for beer and snacks on the patio. It was great finally getting to spend enough time to have a real conversation. We discussed their route back to Florida and their plans moving forward. Afterwards, Louise and I walked to dinner at Villa East, a Chinese restaurant just a block away. It felt very familiar, in the way that many Chinese restaurants do, but the food tasted decidedly non-Asian, though tasty. A pianist played lounge music nearby, which was very pleasant. This morning we decked the tender, weighed anchor, and ran all of five minutes to get here to the dock. Pushing into the current and nose-first into the slip we docked without drama, connected the power cord, and turned on the AC. The last couple of days at anchor we ran the generator about twice our usual amount to get a little AC in the pilothouse and stateroom. Ben and Meghan decided to spend another night, so we will see them again for docktails today. I'm all packed for my trip so I can relax for the rest of the day. I'll grab a taxi in the morning to take me to the airport, and Louise will finally be able to expand quilting operations to the entire boat. I may or may not get a blog post in while I am in Dallas. I'll be back here Friday evening, and it will probably take me a day or two to recover before I can post again. At this point we are scheduled to shove off next Saturday, possibly just to cross the harbor to Atlantis.